If you've been around here for a while, you have probably noticed some big changes to this site. I've recently completed a major rebranding project and moved to Squarespace. Setting up this new site was a true labor of love. I kinda geek out on the branding and design process. Love it! You probably also have noticed that there's been nothing new on my site for ages. That's because I wasn't happy with my website and really didn't want to keep posting and bringing people to a site I wasn't proud of. (Some people love Wordpress. I tried to. I really gave it my best shot, but it wasn't the best choice for me). Now I'm back and settling in, and I've decided to participate in Write 31 Days, a writing challenge for bloggers. I chose to write about wholehearted creative business. It's something I am passionate about, have studied and learned a lot about, and am striving to become better at. 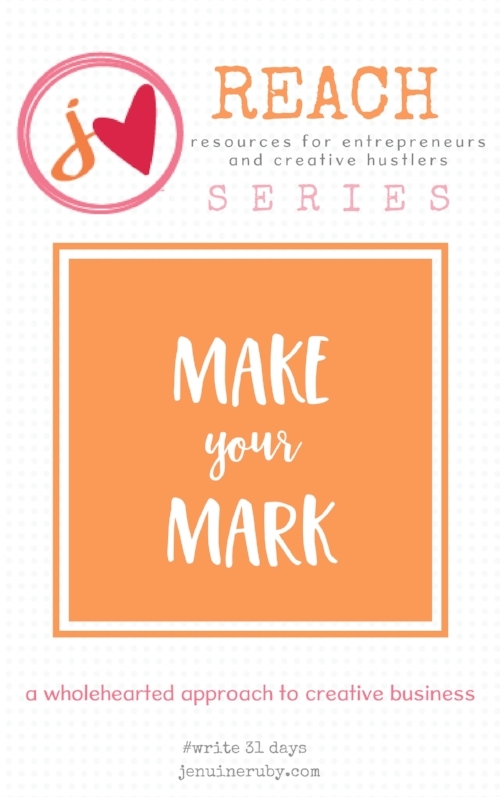 Each day for the month of October, I'll share some insight that I pray helps someone else who is on a quest to start or grow her own creative business. I will keep a running list here, with links to the post for each day. Enjoy! Edited to add this disclaimer: This is not a step-by-step list of a formula to follow to grow your email list, set up a sales funnel, etc. There are so many of those around (some of which are really good, and others with lack luster advice). What this is intended to be is a round up of tips to help you keep your business wholehearted and genuine as you grow. Sometimes we get so inundated with emails and programs with all the step-by-step advice of things you must do now (!) in order to be successful. My purpose is to remain focused on the heart of creative business while working on those necessary action items. Day 2. make peace with your purpose. Day 3. make a wish. Day 4. make a mission statement. Day 5. make a vision board. Day 6. make a list. Day 8. make a plan. Day 14. make your brand. Day 15. make their day. Day 16. make an appearance. Day 17. make a difference. Day 18. make an effort. Day 20. make love not war. Day 21. make something else. Day 26. make your bed. Day 27. make a date. Day 28. make it real. Day 29. make good on your promises. Day 30. make an investment.